With Mother’s Day just behind us, graduations going on almost every weekend this month and Father’s Day almost upon us, you are likely taking a ton of pictures and making even more memories. But how can you make those memories last even longer? 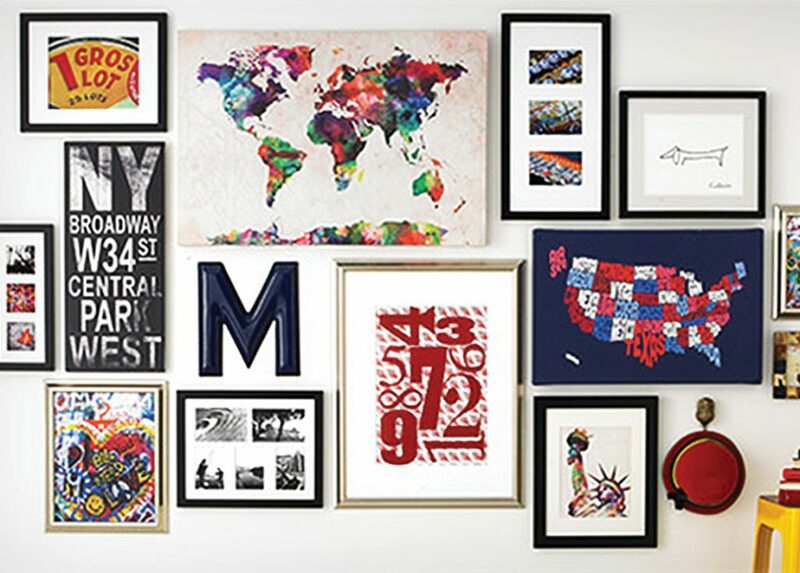 By creating a collage wall. If you’ve ever wondered how to create a collage wall, chances are, you’ve over-thought the process and stifled yourself before you even started! The truth is, a collage wall is quite simple and, surprisingly, free from rules. I am the least likely lady to start a decor or DIY project unless it’s easy…and there really is one key to making this all work. No, it doesn’t involve the perfect hammer or an electric level; it’s having a clean floor. Before you do anything to the wall, gather all the pictures, frames, decor and memories that you want to us in one spot. Make sure you have a large, open space on the floor close to the wall space you want to use so you can “measure” and mirror what the wall will look like, just on the ground beneath it. Once you have everything you want, make a list of what you need: a new frame? a mirror? a small vase? Buy those items before starting to hang anything. While you don’t necessarily need to measure anything on the wall before hanging, it does help to mark your boundary corners so you have a visual you’re working within. Now comes the fun part! Starting with the outer corners, begin hanging those prized pictures and memorable mementos. Pay special attention to color (will you choose a black & white theme, or choose a pop of color to accent the room?) and overall feel of the wall. After all, it will most likely become the conversation piece of the room. There you have it; it truly couldn’t be much easier. All it takes is a few hours, some favorite family memories and your creativity!